Bird grape is a grape of American origin. It is a multipurpose vine bearing medium edible quality. A deciduous spreading climber, that can grow upto a length of 65 m; main stem becoming several inches thick at base. Leaves nearly round, 1½ to 3 in. wide, hairy on veins beneath. 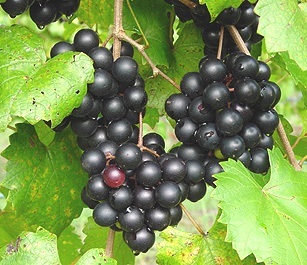 Fruits round, nearly black, 1-1.5 cm wide, skin thin, borne in short clusters, somewhat acid in taste. Bird grape flowers from June to July. The fruits are ready for use from September-October. Bird grape fruits are borne in bunches aand are easy to harvest. 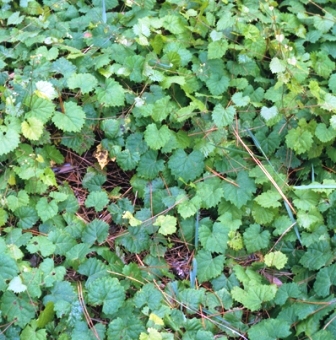 The berries thin skinned and can be eaten raw when ripe. 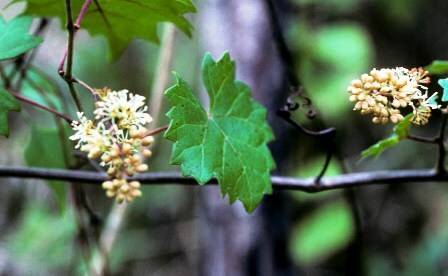 The vine of bird grape not only bears edible fruits, but other edible parts too. Its young tender leaves are cooked as greens or wrapped around other foods and then baked. They impart a pleasant flavour. Even the young tendrils eaten raw or cooked. The sap of this plant is used as a drink. It is best harvested in the spring or early summer. However, tapping of sap should be kept in limited quantity as excessive tapping might weaken the plant. A yellow dye is obtained from the fresh or dried leaves. Bird grape has been rated 3 out of 5 for usefulness and is therefore recommended for cultivation. The vines need a deep rich moist well-drained moderately fertile loam. However, it grows best in a calcareous soil. The vine can grow successfully locations of full sun or partial shade but for proper fruit ripening a warm sunny position is required. Plants climb by means of tendrils. Pruning should be carried out only in winter when the plants are dormant. Otherwise the plants bleed profusely which is not good. Bird grape vines are highly susceptible to honey fungus. Therefore preventive measures to control the infection of this fungus should be carried well in time. The plant can be propagated by cuttings in the same way as done in case of vinifera grapes.